Martial art fans surely will be happy to see the martial arts legend, Bruce Lee, now married to the mobile phone legend, Nokia. After a tantalizing preview of a ten-second video clip named “Bruce Lee’s secret training video” featuring a Bruce Lee lookalike playing ping pong with a pair of nunchaku in the internet a couple of weeks ago, the secret is finally revealed. 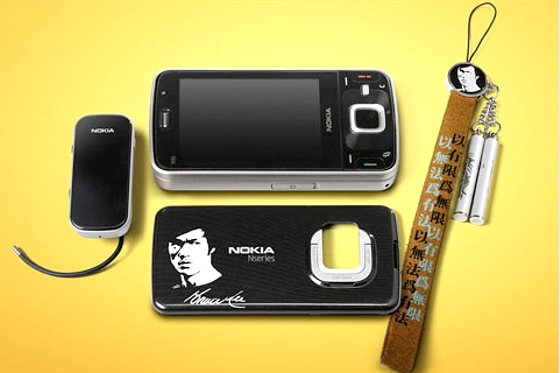 The entire clip, a promotional ad for Nokia N96 Bruce Lee Limited edition phone, is shown full-blown. A Kung Fu Master tying the knot with Nokia – what will the chemical reaction be like? The new Nokia N96 Bruce Lee limited edition phone has Bruce Lee’s face and signature on the back case. The phone is also paced with some rare photos of this Kung Fu legend. The phone also comes with several accessories and a Bruce Lee figurine which is pretty elegant and nice. 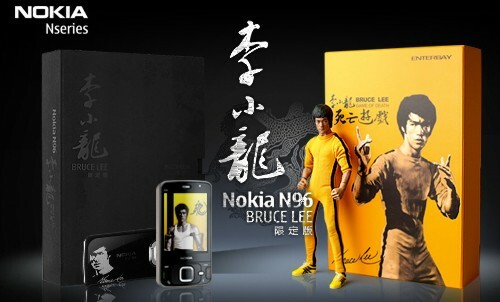 This Nokia N96 Bruce Lee limited edition costs approximately 8,788 Chinese yuan or US$1,286. Bruce Lee’s fans can grab the limited set from the Chinese Nokia site via the link here.